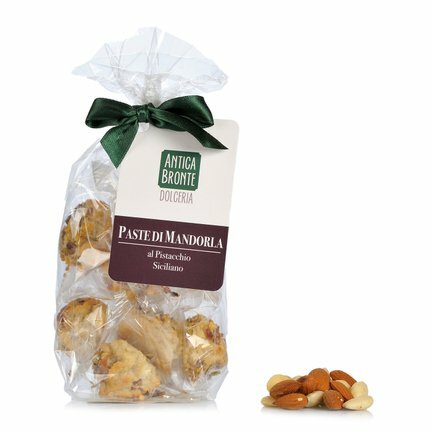 Almond paste is one of Italy's most famous confectionery specialities, mainly prepared in Apulia, Salentino, Sicily and Sardinia. The origins are rooted long in the past and can be traced back to the end of 1100 in the vicinity of Palermo. These almond pastries made by Dolceria Antica Bronte contain the best Sicilian almonds combined with sugar and honey and, in this particularly crunchy version, the unmistakable flavour of Bronte pistachios and essential oil of vanilla. A traditional sweet for all occasions and especially on special occasions. Ingredients Almonds 30%, pistachio 20%, sugar, invert sugar, glucose syrup, sorbitol, honey, sorbic acid, egg white, essential vanilla oil. ALLERGENS: Eggs and egg-based products; Nuts (almonds, hazelnuts, walnuts, cashew nuts, pecan nuts, Brazil nuts, Macadamia nuts For more information on product labels, please contact our Customer Service department. The information on the labels of the products may vary for reasons beyond our control, therefore, there may be discrepancies between the information on the site and that on the products delivered. Please always check the information on the product before consumption or use. Nino Marino and Vincenzo Longhitano are the founders of Antichi Sapori dell'Etna, an historic company in Bronte (CT), famous for the exquisite Bronte pistachio nuts of internationally recognised flavour. The Antica Bronte Dolceria brand was created, in particular, to promote the most exquisite specialities, first and foremost the typical almond pastries and pistachio based confections. The company is effectively a development from the small bakery set up 13 years ago thanks to the creativity and resolve of the founding partners, then in their twenties, who developed their passion through the years for confectionery art, creation of fine products and painstaking attention to the quality of ingredients, which have remained as originally specified in the recipes.